Dry Fragrance: Black tea, lemon, grape, and peach. Tastes like: Clean juicy body with a sweet tea and caramel finish. The new Beloya GR 1 coffee we have in stock is actually a single estate lot which is exciting. This single farmer lot has been selected based on a specific flavour profile. The farmers coffee was separated at the washing station this year, and processed separately as they frequently produce high scoring lots. Dereje Ayalew's farm size is only 0.2 hectares, and coffee is their main source of income. At the Kochere Beloya washing station, only fresh red cherries are supplied to the washing station. Red cherry is freshly hand sorted before pulping. Over-ripe and under-ripe beans are separated before processing. Coffees are pulped and allowed to ferment naturally for 28 hours. Dried parchment coffee is stored in a local warehouse until it is transported for further processing to Addis Ababa. So this year's Beloya GR1 is a fully traceable single producer lot coming from the Kochere Beloya washing station. As mentioned above, the farmers that produce this coffee typically cultivate 0.25 to 1.5 hectares of coffee trees in a garden production system. Garden coffee is a coffee grown under shade in the vicinity of the farmer’s home and it is inter-planted with false banana and other nitrogen crops. Traditional Ethiopian coffee cultivation practices are still dominant among Yirgacheffe farmers. Coffee trees are managed by hand and fertilized with organic matter. In: 20g Out: 40g Time: 30s Equipment: Linea PB, M-One, 21g VST Extractions are subject to many variables including equipment type, but also climatic conditions such as humidity. This recipe is intended as a reference guide only. The best way forward is to experiment, and adjust according to your own tastes. 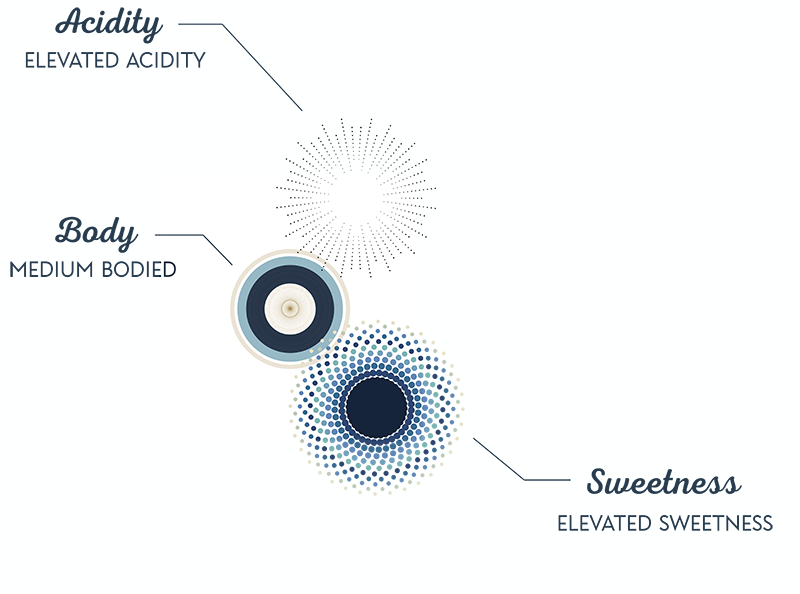 Dry Fragrance: Toffee, honey, and dark chocolate. 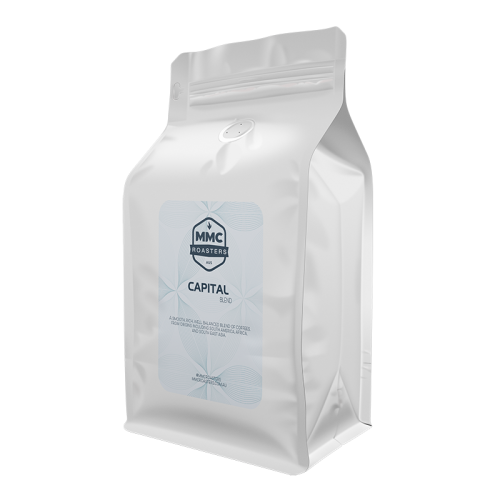 The Capital Blend is a stable coffee in our range, available all year round. It’s a smooth, easy drinking coffee, suitable across a variety of brewing methods. It’s medium bodied, with a long satisfying finish. Pairs well with sweet or savoury dishes. Developed in 2013, the Capital Blend was awarded a Gold Medal in the milk based coffee blend category, at the 2013 Australian International Coffee Awards. And a Silver medal in 2016. The Capital is a fantastic tasting blend that really shines in milk, but is also versatile enough to enjoy black. It’s a blend of coffees from Brazil, Indonesia, and Ethiopia. In: 20g Out: 40g Time: 28s Equipment: Linea PB, M-One, 21g VST Basket Extractions are subject to many variables including equipment type, but also climatic conditions such as humidity. This recipe is intended as a reference guide only. The best way forward is to experiment, and adjust according to your own tastes. Dry Fragrance: Rose, cherry, and plum. Tastes like: Clean silky body, with a fruity finish. Brew method: Recommended as a filter or served black. The Layo Teraga Grade 1 (natural) is a staff favourite. As a filter it's a clean, fragrant, elegant brew. Delicious and memorable. Located in Uraga, in the South of Ethiopia, the Layo Teraga cooperative belongs to the Oromia Coffee Farmer's Cooperative Union. Ethiopian producers typically cultivate 0.25 to 1.5 hectares of coffee trees in a garden production system. Garden coffee is a coffee grown under shade in the vicinity of the farmer’s home and it is inter-planted with false banana and other nitrogen crops. Traditional Ethiopian coffee cultivation practices are still dominant among Guji farmers. Coffee trees are managed by hand and fertilized with organic matter. In: 20g Out: 36g Time: 29s Equipment: Linea PB, M-One, 21g VST Extractions are subject to many variables including equipment type, but also climatic conditions such as humidity. This recipe is intended as a reference guide only. The best way forward is to experiment, and adjust according to your own tastes. 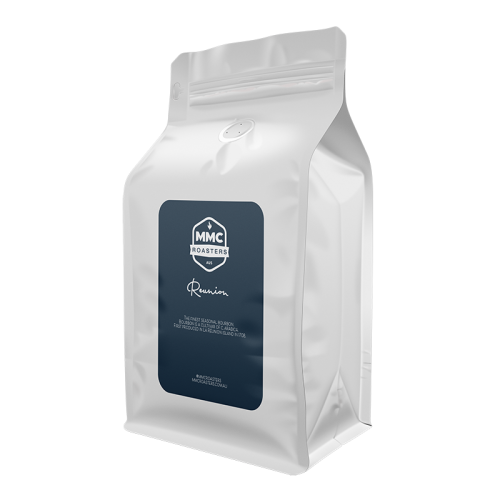 Dry Fragrance: Floral, berries, caramel Tastes like: Caramel This Colombian single origin is a coop coffee sourced from selected regional producers in Nariño. Located in the South West of Colombia, near the border with Ecuador. It's a blend of the varietals: Caturra , Castillo & Typica. 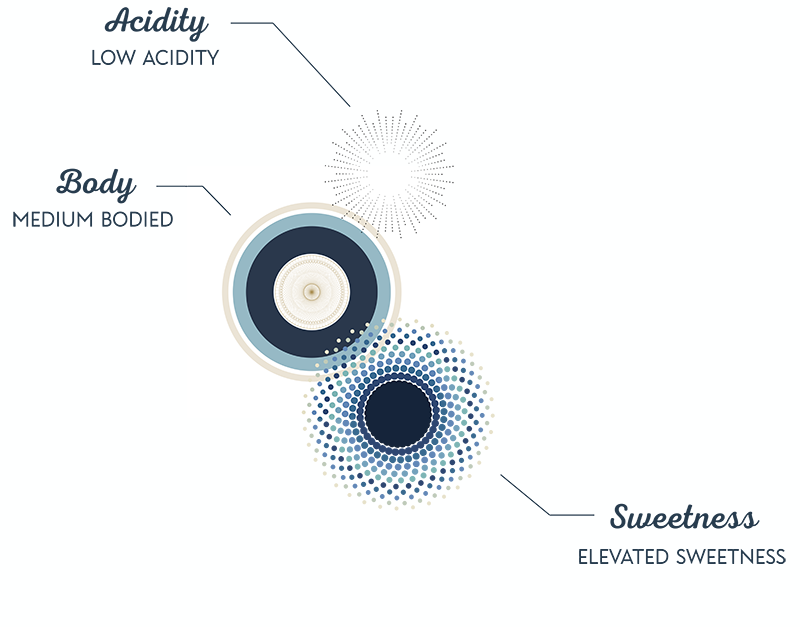 The Nariño region is predominantly known for producing a sweeter tasting coffee with very high acidity. The region has quite a unique geography and climate. Warm winds and plenty of sunshine keep the temperatures at moderate levels throughout the year. These conditions allow farmers to grow coffee at a very high altitude without the risk of frost, droughts or flooding. At this dramatic elevation the air is ‘thinner’, having less oxygen which for coffee trees means that it takes more time to develop ripe cherries which results in more sophisticated acid structures which produce the sweeter flavours, characteristic of the region. 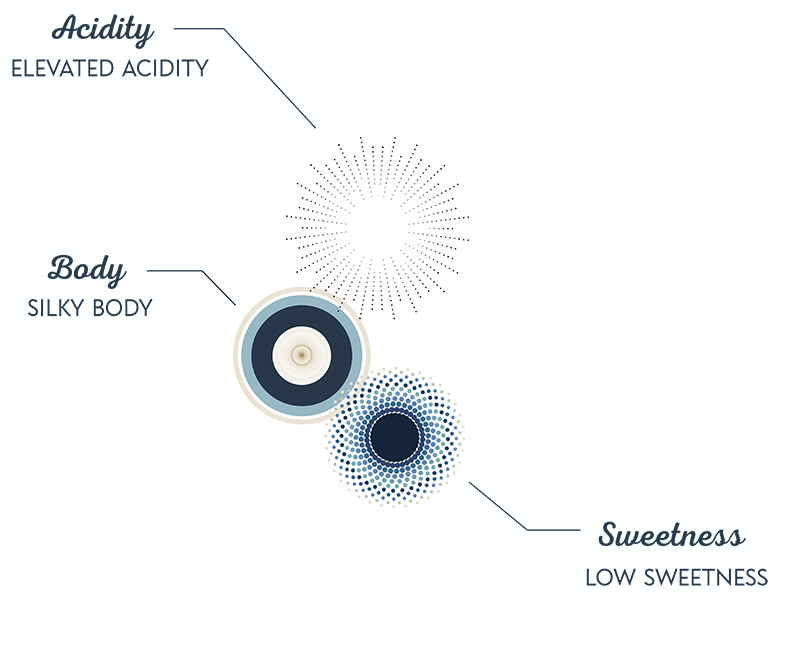 The high acidity levels in the coffee are produced by the combination of volcanic soil and cold night temperatures. In: 20g Out: 38g Time: 28s Equipment: Linea PB, M-One, 21g VST Extractions are subject to many variables including equipment type, but also climatic conditions such as humidity. This recipe is intended as a reference guide only. The best way forward is to experiment, and adjust according to your own tastes. Dry Fragrance: Dark cherry and and dark chocolate. 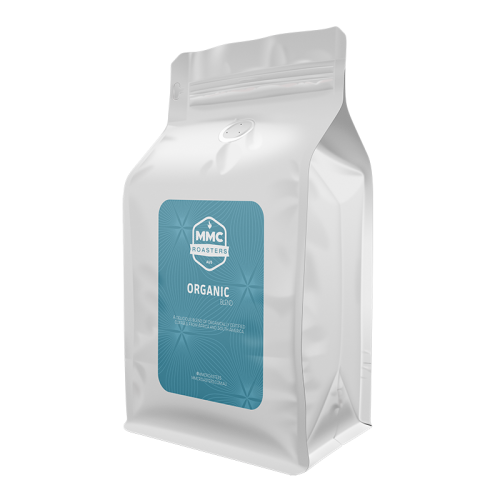 Our Organic Blend is a stable coffee in our range, available all year round. It's features fruit and chocolate flavors. Great as an espresso, even better in Milk. It has medium creamy body, with a long finish. The Organic Blend is a smooth, rich tasting blend of organic coffees from Colombia and Ethiopia, with a dash of Burundi. The Organic Roast was awarded a Gold Medal and Champion Trophy in the milk based coffee blend category, at the 2015 Australian International Coffee Awards. It’s a deluxe coffee, and we are sure you will really enjoy it. In: 20g Out: 39g Time: 26s Equipment: Linea PB, M-One, 21g VST Extractions are subject to many variables including equipment type, but also climatic conditions such as humidity. This recipe is intended as a reference guide only. The best way forward is to experiment, and adjust according to your own tastes. Dry Fragrance: Caramel, plum, blueberry, and cocoa. Reunion is our newest coffee blend. It's available all year round. It’s a smooth, easy drinking coffee, suitable across a variety of brewing methods. Bigger bodied, with a long satisfying finish. Developed in 2018, Reunion is intended to showcase the Bourbon varietal specifically, with the blend comprising Bourbon grown across a number of origins. 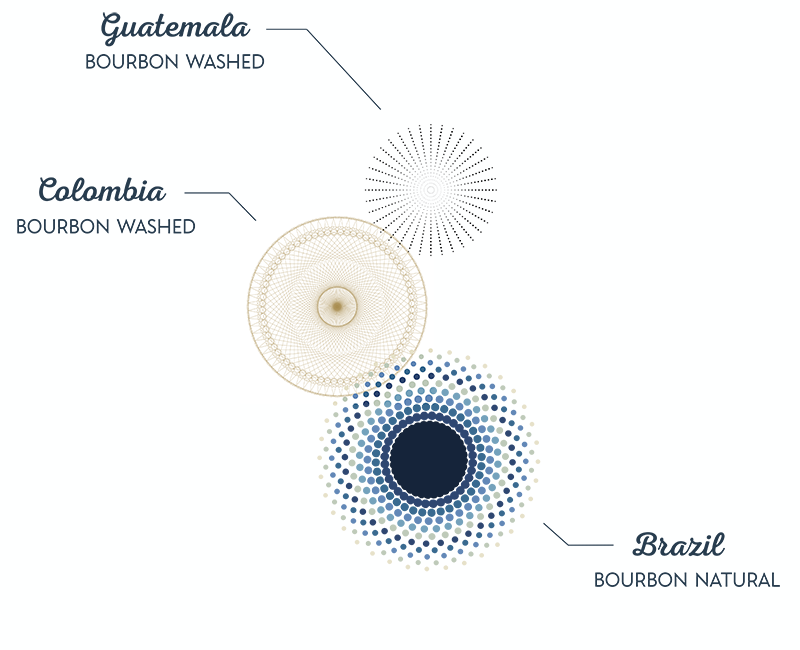 Origins include Brazil, Colombia, and Guatemala. Dry Fragrance: Floral, blueberry, blackberry, plum, spicy, chocolate, citrus Tastes like: Soft caramel nougat and chocolate Our Autumn 2019 Seasonal Blend features coffees from Brazil and Africa. The African coffees included are both a washed, and a naturally processed Ethiopian. From different zones and mills in Ethiopia. We have the Biloya GR1 fully washed from the Gedeo region and Bojiie wetmill. And the Banti Nenka GR1 natural from the Guji zone. Both Ethiopian coffees being from selected small regional farm lots. The Brazil is from Sitio Sertáozinho, and is a natural processed Yellow Bourbon from the Mantiqueira de Minas region in Brazil. The combination of washed and natural processed coffees really balances the cup nicely, and helps smooth out the flavours front to back. In: 19.5g Out: 39g Time: 29s Equipment: Linea PB, M-One, 21g VST Extractions are subject to many variables including equipment type, but also climatic conditions such as humidity. This recipe is intended as a reference guide only. The best way forward is to experiment, and adjust according to your own tastes. 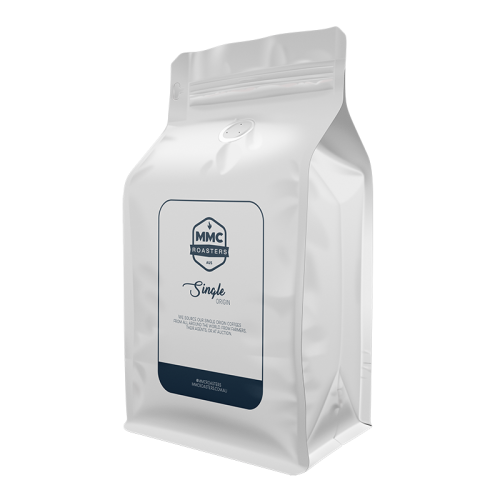 Dry Fragrance: Berries, dark cherry, maple, poached fruit Tastes like: Berry-fruit, dark cherry, and cocoa We have purchased this coffee for a number of years now, and it always represents a high standard. In 2014 Sítio Baixadão won the Brazil Cup of Excellence Awards in the Naturals class. Sítio Baixadão belongs to two brothers, Antônio Márcio da Silva and Sebastião Afonso da Silva, who also manage the properties Santa Isabel and Água Limpa, among others. Coming from a family with another 13 siblings, they grew up in the middle of rice production. The change to a coffee growing began around 20 years ago when the two brothers decided to set aside 1 ha of land for coffee cultivation. What was simply an experience became a passion; nowadays coffee is the family’s main source of income. In: 20g Out: 35g Time: 25s Equipment: Linea PB, M-One, 21g VST Extractions are subject to many variables including equipment type, but also climatic conditions such as humidity. This recipe is intended as a reference guide only. The best way forward is to experiment, and adjust according to your own tastes. Dry Fragrance: Milk chocolate, blueberry, sweet plum, blackberry Tastes like: Caramel and cocoa Mr. Paulo Ribeiro and Mr. Elson Benedito's farm Sitio Sertaozinho is located in the city of Cristina, in the south of Minas Gerais, where they have been growing coffee for over 40 years now. The producers are members of APROCAM, which holds the Mantiqueira de Minas Geographical Indication (GI), which has the objective of guaranteeing the source and traceability of the lot. The farm is committed to sustainable coffee growing through good agricultural practices and preservation of natural resources. In: 20g Out: 40g Time: 27s Equipment: Linea PB, M-One, 21g VST Extractions are subject to many variables including equipment type, but also climatic conditions such as humidity. This recipe is intended as a reference guide only. The best way forward is to experiment, and adjust according to your own tastes. Dry Fragrance: Soft spice and toasty cocoa Tastes like: Cocoa Our Swiss Water Decaf blend comprises coffees from five origins including Indonesia, Central and South America, and Africa. This blend is decaffeinated using a patented water removal process, resulting in the elimination of 99.9% of the caffeine. Without sacrificing the taste, and leaving the flavor intact. 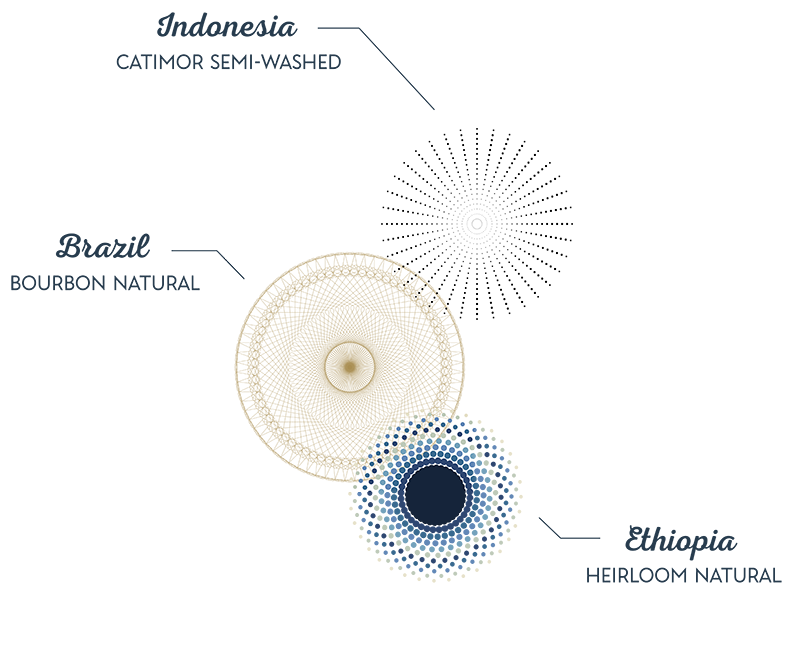 The SWISS WATER® Process is an environmentally friendly, 100% chemical free decaffeination process. Using water from the coast mountains of British Columbia and proprietary caffeine-specific carbon re-generation technology, rather than harsh chemicals such as methylene chloride or ethyl acetate. In: 20g Out: 38g Time: 30s Equipment: Linea PB, M-One, 21g VST Extractions are subject to many variables including equipment type, but also climatic conditions such as humidity. This recipe is intended as a reference guide only. The best way forward is to experiment, and adjust according to your own tastes.